The Cui-ui (Chasmistes cuius) is a lake sucker found only in Pyramid Lake, Nevada . The cui-ui also inhabited Winnemucca Lake up until the 1930s, when a drought in combination with unrestricted diversion of water caused the lake to dry . 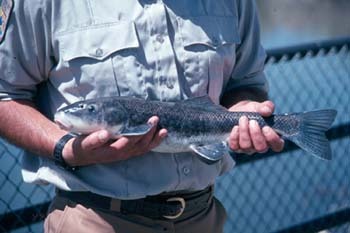 Cui-ui are obligate stream spawners and although adult and juvenile cui-ui inhabit Pyramid Lake year-round, adults also use the lower 19 km of the Truckee River during the spawning season . Cui-ui populations began to decline after the construction, in 1905, of Derby Dam and the establishment of the Newlands Reclamation Project that led to subsequent agricultural diversions from the Truckee River . Approximately one-half of the annual flow of the Truckee was typically diverted in the early to mid-1900s . Due to decreased flows in the Truckee, Pyramid Lake dropped about 25 meters in surface elevation by 1970 . This drop in lake levels resulted in the formation of a sand-bar delta at the mouth of the Truckee river that essentially blocked the cui-ui from ascending the river to reach their spawning grounds except for in occasional high flow years . In addition, increasing agricultural, municipal, and industrial water demands altered the volume and timing of river flows and channelization, grazing, and timber harvesting in and along the Truckee River reduced riparian canopy and increased bank erosion . Industrial and agricultural pollutants from point and non-point sources along the river also began to affect water quality . Stampede Dam and Reservoir (completed in 1970) and Marble Bluff Dam (completed in 1976) have helped control river flow and volume and have enhanced spawning runs . Marble Bluff Dam has created several miles of habitat suitable for cui-ui spawning immediately upstream . The regulation of water flows in combination with restrictions on the harvest of cui-ui, hatchery programs (currently run by the Piaute tribe), and the installation of a fishway at Marble Bluff Dam that can be used to give fish access to the river in low-water years, have led to increasing cui-ui numbers . In addition, as a result of better water management, in 1987, a band of cottonwoods and willows became established along the Truckee river-bank . This resulted in changes in channel and floodplain morphology that, along with increased shade from riparian vegetation, improved aquatic conditions for the cui-ui . From 1950 to 1979 there were only two years in which cui-ui had significant reproductive success . This resulted in the production of only two major cui-ui year classes during this period . The cui-ui avoided extinction only through their longevity; they can live to be up to 50 years old . This allowed the cui-ui to persist over decades with minimal reproduction. In 1983 there were approximately 100,000 adult cui-ui in Pyramid Lake . Nearly 90% of these, however, were from a single year-class produced in 1969 . This situation improved when cui-ui were able to spawn successfully all 7 years from 1980 through 1987 (unusually wet years from 1980 to 1986 likely made this possible) . The adult cui-ui population increased to over 500,000 by 1991 and then jumped to over 1 million by 1992 . The dramatic increase in the spawning population from 1991 to 1992 is thought to be the result of fish that hatched in 1981, 1982, and 1983 finally reaching adulthood and joining the spawning migration . Lower water levels from 1988 through 1991 however, again resulted in insufficient water for spawning runs . Although cui-ui numbers have increased, this could be due (at least in part) to several extraordinarily wet years . Because similar conditions are not likely to occur reliably enough to assure recovery, the cui-ui retains its’ endangered status . Although the fishway at Marble Bluff Dam can transport spawning cui-ui during low water years, these spawning runs tend to be smaller than natural runs and fish using the fishway tend to experience higher stress and mortality . In addition, cui-ui recruitment is highly inconsistent and research indicates that few juveniles have been produced since 1986 . The Dave Koch Cui-ui Hatchery continues to produce large numbers of cui-ui juveniles used to enhance populations . It is unclear, however, how many of these juveniles make it into the adult population and hatchery efforts have begun to focus more on extended rearing . USFWS. 1992. Cui-ui (Chasmistes cujus) Recovery Plan. Second revision. U.S. Fish and Wildlife Service, Portland, Oregon. 47pp. Rood, S.B., C.R. Gourley, E.M. Ammon, L.G. Heki, J. R. Klotz, M.L. Morrison, D. Mosley, G.G. Scoppettone, S. Swanson, and P.L. Wagner. 2003. Flows for Floodplain Forests: A successful riparian restoration BioScience 53(7):647-656. Scoppetone, G.G. and P.H. Rissler. The endangered Cui-ui of Pyramid Lake, Nevada in Our Living Resources, A report to the Nation on the distribution, abundance and health of U.S. plants, animals, and ecosystems. National Biological Service.